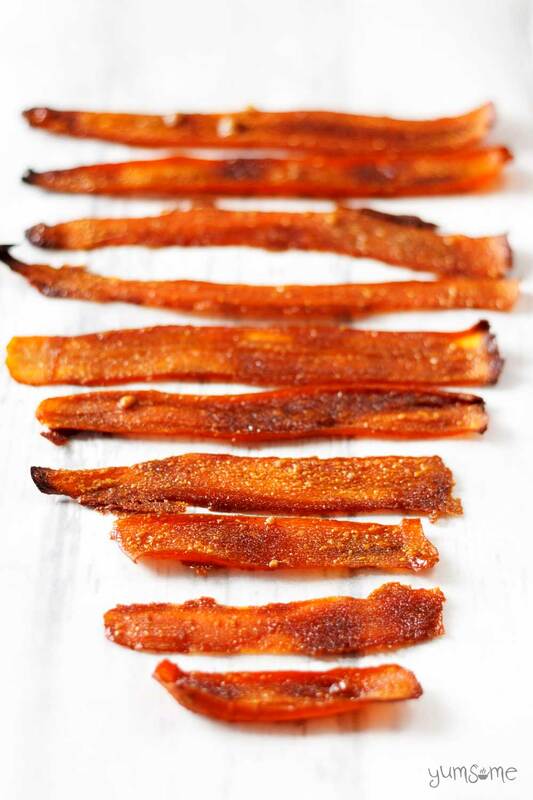 Salty and sweetly smoky, this delicious, easy-to-make vegan bacon substitute is made from carrots and just five other store cupboard ingredients. I know that. However, I also know that carrots can be just as good as bacon, and, in my not-so-humble-opinion, rather better because no animals have had to die so that I can have a yummy meal. 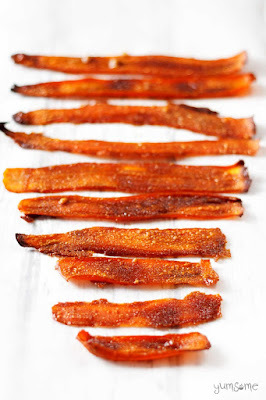 Making carrot bacon is simplicity itself; simply peel and top & tail your carrots, slice really thinly (I use a Y peeler for this), blitz the rest of the ingredients together, marinate for half an hour, then bake in the oven for 15-20 minutes. Peel and top & tail the carrot, then slice very thinly. Blitz the rest of the ingredients together for 20 seconds or so, until you have a thick marinade. Place the carrot and marinade into a dish, mix together so that all of the carrot slices are coated, and set to one side for 30 minutes. Remove from the oven, and enjoy your delicious animal-free bacony treat! Not all ovens are created equal, so if you know that your oven runs hot or cool, do adjust the temperature and/or cooking time accordingly. Similarly, if you use a fan oven, it will need to be a few degrees cooler than the recipe states. 0 Response to "How To Make Yummy Carrot 'Bacon'"